With the advent of Osram's Kreios G1, ETC's LED Source 4, and other LED projectors, customers are choosing the money-saving capabilities that plastic gobos present and are choosing to make their own. However, they are also quickly learning the hard way that there is more to making a good projection than just printing an image on a piece of acetate. Introducing Cool Ink™ and Cool Ink HD™ gobos, both of which draw on Rosco's ten years of iPro slide experience making printed, plastic projections and are available now for use in virtually any LED based luminaire. 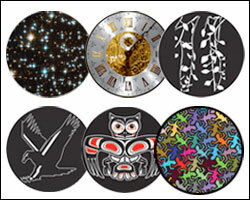 Rosco is thrilled to release over 150 new gobo designs - all of which were contributed by lighting designers, multi-media artists and graphics professionals from around the world! This is the largest expansion to Rosco's gobo library in 5 years, and includes new designs to project nature, geometry, commerce, construction and global cultural icons. 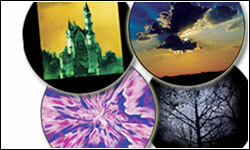 The largest and most popular gobo range in the world is now available in digital form! Rosco's extensive library of black and white, grey scale and colour gobos have been sized for HD and are ready to use as masks, layers or animations with virtually any media server. In addition to the more than 2000 static images available, the Pixel Pattern™ collection includes 100 unique and dynamic animation loops. 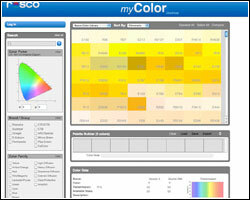 Rosco myColor is a free, new web-based tool for any of your customers that use color filters, including: lighting designers, assistants, theatre companies, teachers, students, cinematographers, gaffers, grips, best boys, photographers - the list goes on. myColor allows them to search, sort, research and gather the color filters they need. Once they've created a myColor account, they can also create palettes of their favorite or most-used filters, make notes about a color, save a show, and export their findings so that they can share their ideas with colleagues. 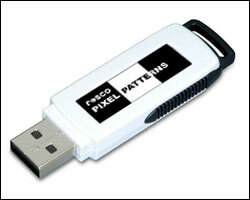 This is a fantastic tool for you to share with all of your lighting customers.